This time of year it's typical to feel like you're on a rollercoaster ride in New Jersey. For a few days it will feel like Fall or even late Summer, and then you wake up the next morning and it feels like Winter. And today is a Winter "feels like" day. When I went out to the Jeep at lunchtime, it was only 43F (6C) and there was a slight bit of a breeze to make it feel even cooler. It was sunny, however, so at least it was pleasant to be outside, albeit chilly.. The Buddistick goes together in under a minute and is on the car roof in just a few seconds more, so antenna assembly is not something dreaded, even in the cold weather. Interestingly, how the coax behaves is a good indicator of what the ambient temperature is - a kind of pseudo thermometer. When the coil becomes stubborn and doesn't want to undo itself easily, you know it's below 50F (10C). I heard PZ5W on 18 Meters again. This was the band where I unsuccessfully tried working them last week. There's just something about a pileup that draws me like a moth to a flame! I don't know what it is, but it's like trying to look away from a train wreck, or trying to eat just one Lays potato chip (remember that TV commercial, fellow oldsters?) Even though I have them in the log via QRP - that was 20 Meters ..... and there's this pile-up ...... it's like a siren's call. And this time I was successful! On about my third try, I got in their log book for the second time. This time they were working simplex, which adds to the challenge. You really have to time throwing your call out at just the right moment. Lady Luck was with me today. There didn't seem to be much else doing on 17 Meters that I was able to hear, so I ventured down to 20 Meters and called CQ near the watering hole. I was treated to a short, but very pleasant QSO with Jim AF5BA in Arkansas. Jim was using his Yaesu FT-817 to and MFJ vertical, which was doing a good job for him. Unfortunately, the outside temperature wasn't the only item on the rollercoaster - QSB seemed to hop on for the ride. Jim was 359 at QSB peaks and about 579 on QSB lulls. What a treat to weary eardrums! But it was fun completing the 2X QRP QSO with Jim. Unfortunately, time flies when you're having fun and it was time to tear down and go back inside to work. The next two days are looking rainy, weather-wise, so they may not end up being lunchtime QRP days. But then again, today was "supposed" to be overcast and cloudy ..... so you never know. The weekend is not over, but the family will be busy this afternoon, so I wanted to get a few words in. The Thanksgiving holiday was wonderful. 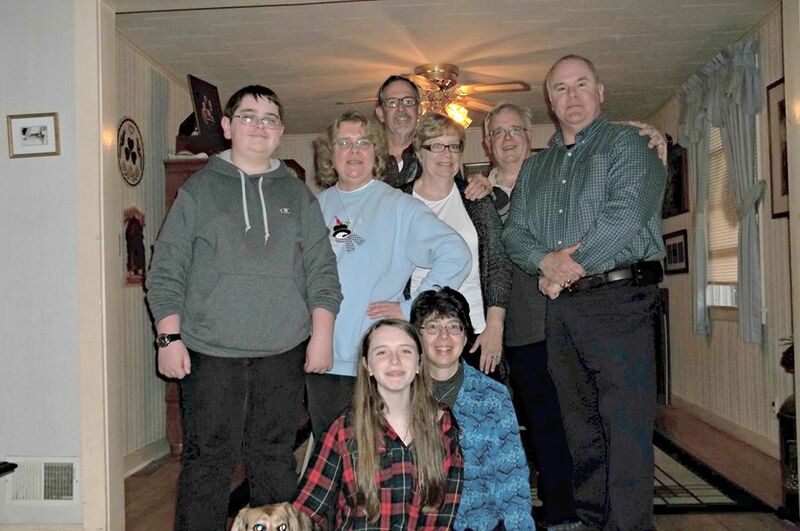 The family came over, my sister and her husband, and Marianne's brother and his wife. 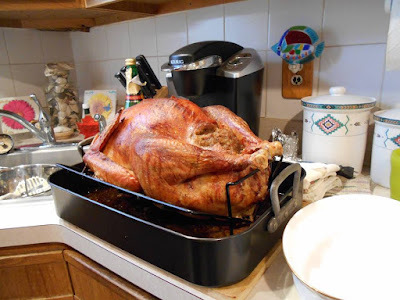 And we feasted on turkey, ham, stuffing, sweet potatoes, mashed potatoes, spinach, cranberry sauce and gravy. And the turkey came out nice and juicy. W2LJ didn't screw it up this year! Friday was sunny and warm, a great day for getting outdoor Christmas decorations up. Not trying to rush the season, but I'd much rather string outdoor lights while the temperatures are in the mild 60s instead of when it's closer to freezing. From what I have been able to gather, this straight key is about 1937 vintage and was constructed before they went over to the Stream line style base. Better than winning the key was hooking up with Don Younger W2JEK while I was there. Don is an avid QRPer and his call should be very familiar to anyone who has entered a NAQCC or QRP ARCI Sprint or contest. We chatted for several minutes and it was good to catch up. Yesterday and this morning was spent picking off stations and handing out points in the CQ WWDX contest that is running this weekend. I managed one ATNO. Mozambique C92ZO on 10 Meters yesterday afternoon. Since I'm in the contest just for the fun of it (any ATNOs that I can garner) I made a sort of game for myself of just hunting for and trying to work Polish stations. Band conditions are good, but not the greatest. Working stations with 5 Watts has been more of a challenge this year than in the past couple. I guess that's the consequence of the down side of a solar cycle. 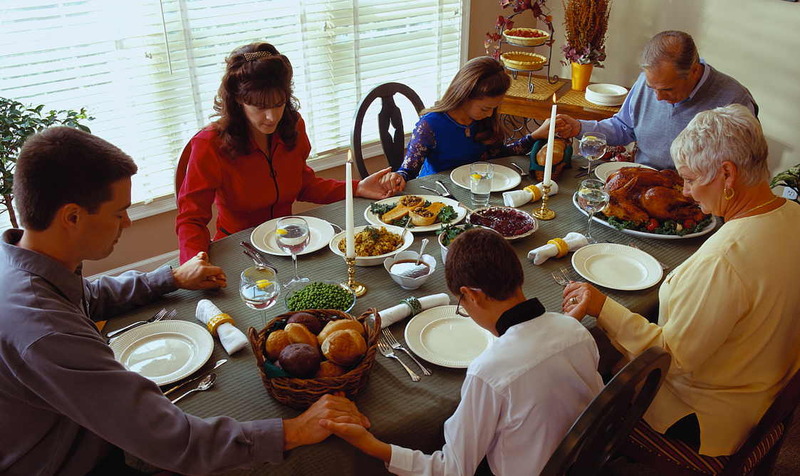 Gracious God and Father, who supplies us with every blessing in abundance, lift up our hearts in gratitude and thanksgiving. Open us to remember the gifts we seldom notice, the bounty we take for granted, the rich possibilities that You provide. For bread without scarcity, for water that is pure, for houses to live in and friends and family to enjoy, we give You humble thanks. For beauty and bounty, for healing and hope, for the power of Your Word, we lift our voices in joyful praise. Dwell with us now and always. Amen. From the W2LJ household to everyone, everywhere, we wish you peace, joy, love and happiness on this day and throughout the year. So ..... you're a QRP DXer. You hear a country you want to work, but it doesn't go well. What do you do? You never give up, that's what! If you don't work them today, you may work them tomorrow, and in my case that happened to me, today. I started my lunchtime QRP session fully intending to work the N3AQC QRP-pedition to the USS Requin which is docked by the Carnegie Science Center in Pittsburgh. John K3WWP and Mike KC2EGL were there today, and I figured that maybe, just maybe, I might be able to hear them on 40 Meters. So I set up the Buddistick for that band - magmount base, all four 11 inch arms, untapped coil, extra long whip. I was able to get the SWR down to about 1.5:1 and I heard plenty of signals, but no N3AQC. They started at 10:00 AM, and by the time I was able to get to the parking lot, it was 1:30 PM, so I don't know if they were on lunch break also, or perhaps they had just called it a day by then, or perhaps they were on 20 and 30 Meters. But tuning around for about 15 minutes and not hearing N3AQC, I decided to switch over to the higher bands, as lunch time is only an hour. So I took two of the 11" arms off, put the coil tap in its accustomed position and put the Buddistick back on the roof. Tuning around, at 14.018 MHz, I heard them - PZ5W - Suriname. The same station from yesterday, and they were even louder than they were on 15 Meters. So without even thinking, I dialed in a 1kHz up split and gave a call ... and was heard. I sent my info and completed the exchange and then looked down at the KX3. In my haste, I hadn't touched up the SWR with the autouner. My SWR was 1.7:1 and the KX3's power had folded back to 3 Watts. So what I couldn't accomplish with 5 Watts yesterday, got done with 3 Watts today. That felt nice - really, really nice. Looking at my watch, I saw I had about 15 minutes left before I had to break down and go back into the building, so I prowled around the band some more for a few minutes. Lo and behold, T2TT - Tuvalu coming in loud and clear! Argh! Ten minutes was not enough to even consider it a decent try, but I did - and failed. But ...... tomorrow is always another day. 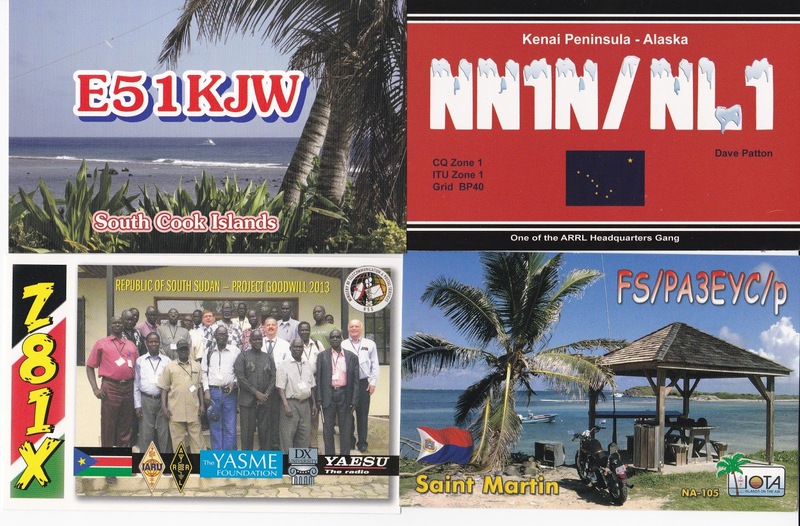 The cool thing is that looking back in my log, these were all done with QRP - even South Sudan. Interestingly, the day and date recorded on the card are indicate that this card is a result from my second QSO with them, which was the QRP one. I don't know where the card for the first (QRO) QSO is. Perhaps they got my call wrong and it ended up being a busted QSO. Who knows? I went out to the Jeep this afternoon and was hearing PZ5W from Suriname on 15 Meters. He was very loud and I really thought I was going to get a QSO. As luck would have it, I didn't. There was a pileup but it was by no means fierce. I just wasn't being heard. You know it's a bad sign when the station calls CQ and no one answers but you, and the station starts calling CQ all over again. I already have Suriname in the logbook - even QRP - but from the car with the Buddistick, that would have been a hoot. 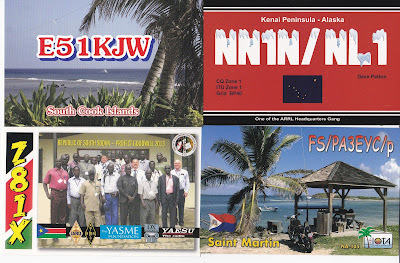 This coming weekend is the CQ WWDX CW contest, a great contest for working QRP DX. Of course, I am going to be listening for ATNOs. Hopefully I'll work one or two. I may also try milliWatting to see how many entities I can work with under a Watt. Let's hope for great band conditions this weekend! QRP - When ypou care to send the very least! Let the cold weather come when it may, I'm ready to be toasty warm with a new hoodie sweathshirt. SB QST ARL ARLB034 ARLB034 World Radiocommunication Conference Approves Global 60 Meter Allocation! The Plenary Meeting of the 2015 World Radiocommunication Conference (WRC-15) in Geneva has approved an allocation of 5351.5-5366.5 kHz to the Amateur Service on a secondary basis with a power limit of 15 W effective isotropic radiated power (EIRP). The November 18 decision on Agenda Item 1.4 was adopted on two back-to-back readings. Some Region 2 countries, but not the US, will be permitted up to 25 W EIRP. With this action, and despite conditions that are more restrictive than had been hoped at the start of the Conference, the Amateur Service has obtained its first new global HF allocation since 1979. The new band will not become available until and unless the FCC adopts the Acts of the Conference and establishes operating rules. Until then, the five discrete channels will remain in place. The International Amateur Radio Union (IARU) team in Geneva is now focusing its efforts on tweaking the agenda for WRC-19. It is likely, but not certain, that the agenda will include an effort to harmonize the Amateur Radio allocation at 50 MHz. A proposed agenda item to align the 160 meter allocation in Region 1 with the rest of the world is no longer under active consideration. The WRC-19 agenda will also likely pose spectrum defense challenges, including the possible consideration of the 144 MHz and 430 MHz Amateur Radio allocations for sharing with the space operations service, and the possible consideration of one or more bands above 10 GHz for 5G smartphone use. The bounds of these potential defensive items, however, are still under discussion. Now it's up to the FCC as to if/when this will become a reality here in the USA. What's a Fox hunter to do? Tonight was the 40 Meter QRP Fox hunt. The two Foxes were Rick NK9G in Wisconsin, and Steve WX2S in New Jersey. I worked Rick very quickly. I was probably among the first five pelts handed out, I would imagine. Our exchange was completed so close to the top of the hour, that I had to be one of the first. With Rick in the bag, I went hunting for Steve. With a little effort, I found the pack chasing him, and then going down 1 kHz more, I found Steve, himself. But man, oh man, was he weak! Steve lives close to me, only 18.5 miles as the crow flies. For 40 Meters, I was in the dreaded "skip zone". Too far away for ground wave, but way too close to be at the other end of "the bounce". I was not happy at the thought of spending the next 80 minutes straining to listen to Steve's ESP signal, hoping that some miracle would occur and that I could work him. Then it occurred to me ...... I have a KX3, I have a Buddistick, I have a Jeep. What's a Fox hunter to do? That's right! 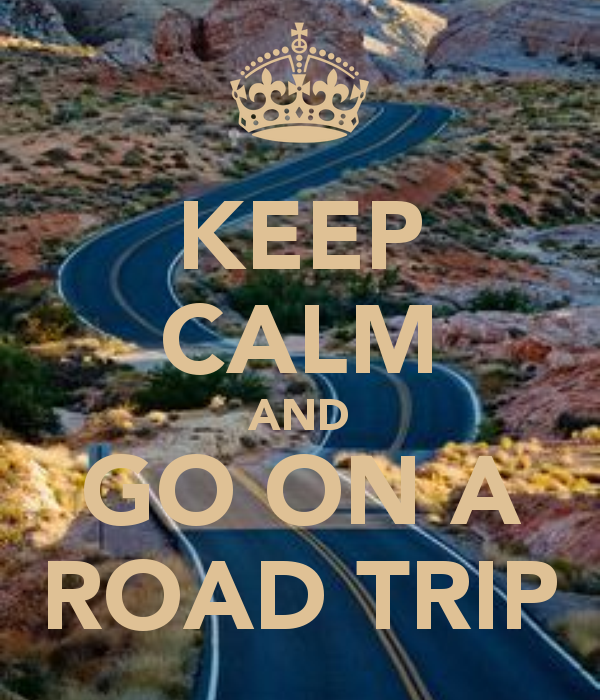 Go on a road trip! Even though it was after 9:00 PM, I figured that if I could cut the distance to Steve's house by half (or better) that I stood a reasonable chance of being within groundwave range. I tossed the KX3 in the Jeep, and headed out. The neat thing is, that after 9:00 PM at night, about 90% of New Jersey's notorious traffic is non-existent. I had a destination in mind, and made my way to it. You have to understand, that for the most part, New Jersey is pretty flat. Until you get to the first ridge of the Watchung mountains, everything in New Jersey to the east is Piedmont. So straight line from South Plainfield, where I live, to Kingston where Steve lives is flat. However, as you travel south down Route 1, there is one hill. The hill is where appropriately named Sand Hill Road crosses Route 1, and the landmark there is this massive water tank that's the property of the township of South Brunswick. In fact, it is very near there where the KA2RLM repeater is located - a UHF repeater with great coverage. I knew that if I could make it to that area - the high ground, so to speak, that I stood a great chance of working Steve. Fortunately for W2LJ, at that intersection is a conveniently placed McDonalds with a huge parking lot. I pulled into the lot, all the way towards the back so that I would draw as little attention as possible. I put the Buddistick together - all 4 eleven inch arms, the coil untapped and the whip fully extended - and placed it on the car. The KX3's autotuner gave me a 1.7:1 match, Not great, but not bad. Power would probably be folded back by about a Watt. If I had time to futz around, playing with the whip sections would have given me a better match, but I wasn't being fussy. I tuned the KX3 to the frequency where I heard Steve at while I was at home. He was coming in like gangbusters! He was a solid 559, but compared to how I was hearing him at home, Steve sounded more like 599. I listened for a bit, only to find he had ceased working split and was now operating simplex. I gave him a call, and first shot - I was in the books! I signed W2LJ/M so he would know that I was mobile (even though I was stationery - perhaps it would have been better to sign /P), But no matter, I had a second pelt in the bag! I disassembeld the Buddistick, put all the other equipment back in my day pack and drove home, a happy Fox hunter! This is the worst! Yuck! Argh! Ack! Ptooey! Please take my word for it! As I've told so many times before, I know the frustration of not being able to learn CW. I put off getting my license for at least five years (maybe more), because I could not wrap my brain around the code. And one of the major reasons for that lack of brain wrapping was because someone thought that they were doing me a good turn by handing me a chart similar to the one above. From personal experience, I can tell you that making the jump from audio input to visual input to brain is the perfect recipe for frustration and resignation. I made the mistake of hearing, trying to visualize and then decode. What you need to do is skip that visual step. 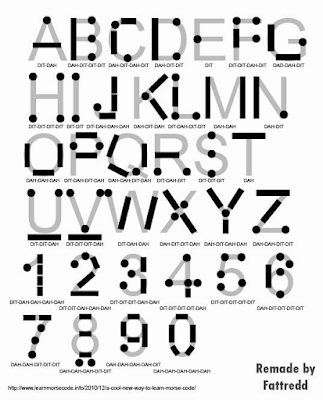 Morse Code is a heard language, and unless you're in the Navy operating signal lamps, it's primarily an aural language. To this day, I have extreme difficulty (in fact, I don't even bother) when people "type" out cutsie messages using periods and hyphens to make dits and dahs in print. I have to hear it to de-code. No ifs, ands or buts ..... I have to hear it. Think about it for a second. When you were a baby, how did you learn to talk - by reading, or by listening to your parents and siblings? So thanks be to God for the Hams who taught my Novice class. They handed me a set of ARRL Morse Code cassettes with only one word of instruction - LISTEN! And in the end, that's what did it, but the damage had already been done. I had to "unlearn" my past efforts and had to re-learn the direct step of "hear, then de-code". For me, that damage lasted well past 5 WPM. I was stuck at the 10 WPM barrier for a long time, and it was only by the Grace of God that I was able to get up to 13 WPM within 6 months in order to earn my General ticket. So my advice for those wishing to learn Morse? 1) Ditch any visual aids, as if they were a rattlesnake or the plague. 2) Listen to letters being generated at a speed of anywhere from 13-18 WPM. Let the spacing between the letters determine the code speed. If you listen to Morse being generated slowly and drawn out, you're more than likely going to suffer the 10 WPM plateau like I did. 3) Limit your dedicated practice sessions to no more than 15-20 minutes a pop - two sessions a day, max. At other times, I find it helpful to have Morse playing quietly, almost subliminally in the background while driving, doing chores, etc. IMHO, it gets your brain used to hearing it, and before you know it, you're going to be picking out characters without even realizing it. Lastly, I never liked the concept of listening to random characters once I learned the alphabet. From then on, I found it most useful to listen to actual words and not letter groups. Let's face it, unless you're a spy, you're going to be on the air making conversation - not sending clandestine messages. 4) Once you've learned all the characters and numbers and basic punctuation, and feel somewhat confident in being able to de-code, then get on the air and make QSOs. Real live QSOs are without a doubt, the best vehicle towards increasing your code speed. You can find a lot of beginners hanging out in the 7.120 MHz neighborhood of 40 Meters. 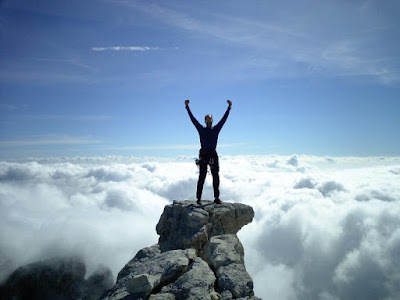 5) Relax, and don't get down on yourself. We all learn things at different speeds. Some people are quick studies and then there are people like me. But if you stick with it, you will get it - I promise. 6) Make full use of W1AW code practice and all the free CW learning software that's out there. Personally, I keep "Morse Trainer" by Wolphi on my phone. It's not a free app, you have to pay for it, but it will generate Morse at speeds up to 60 WPM. I keep it set at 40 WPM. Can I de-code Morse that fast? No way in heck! But I can tell you that after listening (JUST listening - not even trying to decipher) code at that speed for 15 minutes .... code sent at 25 or 28 WPM sounds a lot slower than it used to. I suffered the double whammy. I had to "unlearn" the aural to visual to brain process; and then once I actually learned the code, I had to unlearn the "code letters sent at 5 WPM" error. Look at me now - CW is my most preferred mode and I am comfortable anywhere around the 25 WPM mark! On a good day, if I don't tense up, I can go for short bursts of 30 -35 WPM. 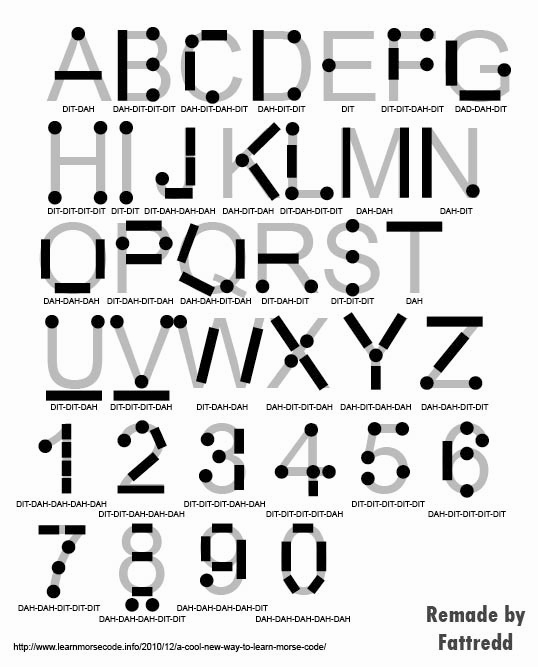 The bottom line is, that learning and becoming proficient with Morse Code is not impossible, in most cases. Take it from someone who thought it was. A tip o' the hat and thanks to George K2WO for pointing out a new one - and it looks like a good one! Is that a cool title, or what? "Lower your power and raise your expectations." So much to do ..... so little time. We have been fortunate in New Jersey. For the most part, with some exceptions, the days of September, October and November have been pretty mild. That is about to change drastically, though. We've had some warm but nasty weather the past two days, and the winds of change are blowing in. Today and tomorrow we're going to have windy days with sustained winds at 15-20 MPH (24-32 KPH), with gusts up to 30 MPH (48 KPH). It's going to make raking leaves a fun chore tomorrow. Maybe I'll get lucky and they'll all blow away! 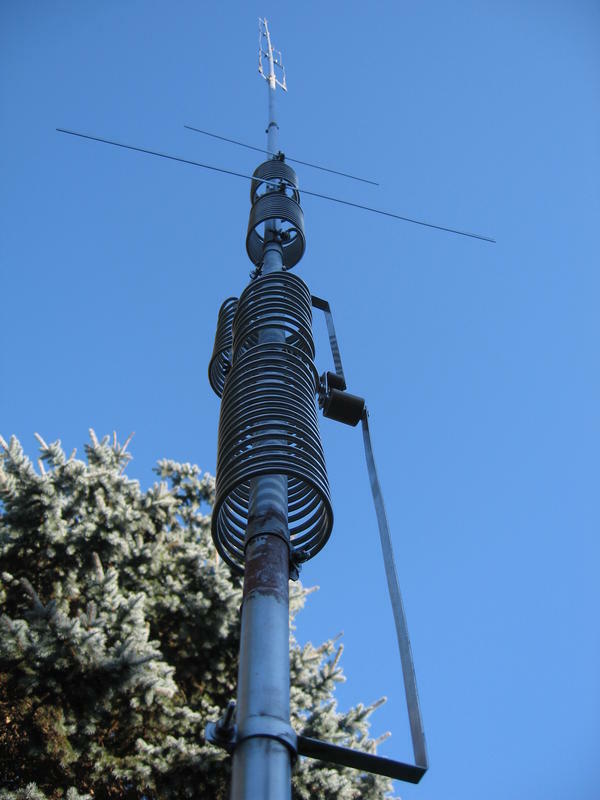 With the coming of colder weather, and less outdoor time, brings the prospect of Wintertime Amateur Radio projects. And like every other Ham that I know, W2LJ has a "To Do" list. My problem is the list keeps getting longer and never seems to get shorter. 2) Get my 4 States QRP antenna tuner built - it arrived a few weeks ago. Then I can put my ZM-2 back in my portable ops backpack. 3) Get my 4 States Ozark regen receiver built. 4) Get my "Glowbug" 40 Meters tube transmitter kit built - to go with the Ozark. I bought this so long ago, I can't even remember when. 5) Homebrew an antenna tuner for the Novice station - something that will handle 50-75 Watts. And the list can go on, if I care to think about it more. The problem is an age old one, namely time, or the lack thereof. Lawn mowing and leaf raking get replaced by snow shoveling (I hope not), holiday stuff, house cleaning (that never goes away), and various other sundry chores. In addition, there's chauffeuring the kids around, various civic and Church commitments, etc, etc, etc. I'm not complaining (well, maybe a little) as it sure beats not being able to do all this stuff, but it seems there's barely enough time for doing the things you HAVE to do, let alone to do the things you WANT to do. In addition to all this building, it would be nice to just squeeze in some operating time, too. Anybody want to take bets on what I'll actually get done? To be totally honest with you, I have no idea, myself. Butternut vs GAP - a personal perspective - and something else. NB: The purpose of this post is not to start a war between GAP users and Butternut users. It is simply a recollection of experiences and impressions from a Ham who has owned and used both products. I have probably mentioned these in past posts, but the subject recently came up with a person who had asked me for my thoughts on purchasing an HF vertical. I purchased a GAP Challenger back in the early 90s when I was still living at my old East Brunswick, NJ QTH. Up until that point, I had strictly been a user of dipoles, doublets and long wires. My first antenna as a Novice was a Mor-Gain multi-band dipole. Remember those? That antenna worked very well for me for many years. I wanted to buy a vertical as I thought the lower take off angle would garner me more DX. Back then, my operating style was very eclectic. I took full advantage of the Amateur radio smorgasbord. I was into EVERYTHING (or so it seemed)! I was operating QRP, QRO, satellites, digital, DX - you name it. About the only thing I wasn't doing was phone. Not to cast aspersions on SSB or AM ops, it's just not my thing. I've gone into that in detail previously, so I am not going to re-hash that here. I thought, after reading many articles, that a vertical would help me towards that goal of earning DXCC. At about that time, GAP was a young company, not even 10 years old. They were making a name for themselves. GAP was the Wunderkind, the "new kid on the block", they were splashy, new, and they were being advertised all over Amateur Radio creation and always seemed to be featured in magazine articles. 1) It was a new company, and I like to try new things. 2) They had antennas that were priced right to fit my budget at the time. 3) The Challenger model advertised the need for only three radials. 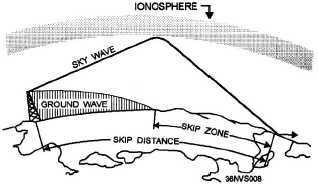 4) The antennas were actually not dismissed as "junk" by Kurt N. Sterba, the antenna expert from WorldRadio. In my mind, this counted a lot! So I bought a Challenger. It assembled very easily and went up well. I was able to build it and deploy it by myself. And it performed VERY well with the factory supplied radial kit. And yes, it was only three radials. If memory serves me correctly (and it may not), they were three 25' (8 Meter) radials. The "secret" was that for the most part, the Challenger was a vertical dipole, which didn't really need radials. I was getting DX at a better clip than I was getting it before. In all honesty, I can't tell you for sure whether that was due to the fact that I was on a DX jag at the time, so I was concentrating on it more, or because of the antenna. I tend to think it was because of the antenna, but I have no scientific proof to back that up. 1) It wasn't stealthy. That's not GAP's fault. If I had had more trees in the backyard to "hide" it in, it would have been better. As it was, it stuck out like a sore thumb and boy, did my backyard neighbor-one-over take notice! In his mind, I had totally eliminated his ability to watch television. In addition, all other electronic maladies that occurred in his house were my fault. If there was a flickering of the lights, or a brownout, it was my fault. If he blew a fuse in the fusebox, it was my fault. If someone called him on the telephone and hung up before he could answer, it was my fault. If a CB'er running power (we lived about a block away from a heavily used State Highway) came through his TV speaker, it was my fault. If a house fly passed gas too loudly, it was my fault. You can see where this is going, right? 2) The antenna was not as sturdy as I would have liked. Again, this is totally a subjective thing. The few years that I owned that Challenger, coincided with some pretty horrific New Jersey winters. Ice storms, blizzards, the whole nine yards. In fact, in the Winter of '96 we had what was later called a "white hurricane" - cold enough weather in combination with a monster Nor'easter that resulted in a blizzard that dumped about 32 inches of snow with just under official hurricane force winds. The GAP survived all of that (I had it guyed, which was an absolute necessity), but in the process I had so many bad cases of agita that I can't even count them all. At times, the Challenger was so bent over with ice that I thought it was permanently damaged. "How the heck can an antenna bend that far and not snap? ", popped into my mind so many times. And in the summers, during thunderstorms, the Challenger swayed like a hula dancer stoked out on sugar, caffeine and methamphetamine (all at the same time!). To its credit, the antenna always survived. There were times that I felt that I wasn't going to survive while I watched its gyrations, but yet it always survived. I eventually sold the antenna. Not because of the gyrations, or the antenna's performance (which was great), but because things got so bad with the neighbor that I had to do it to keep the peace. I know ..... the coward's way out, but you have to understand that at the time, I was still living at home in order to help support my elderly parents, and I didn't want to make life miserable for them. If it was MY house and MY property, I would have taken the vertical down .... and replaced it with a tower and a beam ...... but it was what it was. 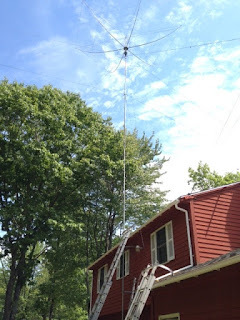 When I moved to the current South Plainfield, NJ QTH, I decided to put up another vertical. This time I chose the Butternut. I have had it up for over a fifteen years now and am quite happy with it. The Butternut HF9V is a true vertical and because of that, it requires radials. When I first installed it, I put down 26 radials. I just placed them on the grass and installed a lawn staple every 3 feet or so to hold them down. Within a few months, the grass grew over them, concealing them completely. Two years ago, I put down another bunch, to bring the number up to 58 radials total. I've damaged three over the years with the lawn mower, so there are about 55 good radials in the system (and three very short ones!). The antenna performs superbly, as far as I am concerned. I am as satisfied with it, performance-wise, as I was with the GAP. The one area where the Butternut exceeds the GAP, in my humble non-engineer's opinion, is in the area of sturdiness. Since I moved to South Plainfield 17 years ago, I have experienced three major hurricanes (Floyd, Irene, Sandy) and the Butternut survived each without a whimper. Yes, the antenna did sway in the winds a bit - but compared to the GAP, it stood rock steady. And unlike the GAP, the Butternut is not guyed, nor does it need to be. During blizzards, ice storms and summer thunderstorms, I can go to bed and not miss a wink of sleep. I don't have to give the Butternut a second thought, or swallow a bunch of antacids. To me that peace of mind is worth a lot. Now, that all being said ...... if the Butternut were to be disintegrated tomorrow by some kind of death ray from an alien spaceship, I would probably go back to being a GAP owner. The price difference is the key reason - $369.95 for a Challenger - $604.95 for an HF9V. By they way, that is NOT what I paid for mine. I simply can't afford to replace it. With two kids rapidly approaching college age, I would definitely need to shell out fewer bucks. The needs of the many outweigh the needs of the one. As a result, I would guy the heck out of the antenna, and would then spend the almost $200 saved, slowly over the next years by investing in either Rolaids or Tums, or by buying myself a pair of horse blinders. Whichever works out cheapest. In other breaking news - may a 60 Meter QRP band (not channel - but band) be in the offing? 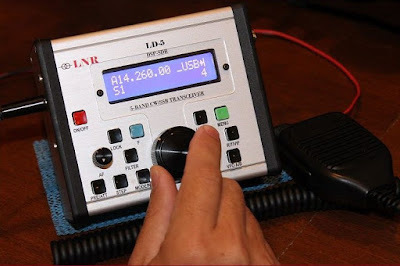 "At World Radiocommunication Conference 2015 (WRC-15), in Geneva, consensus continues to shape up around a new 15 kHz-wide global secondary 60 meter Amateur Radio allocation at 5351.5-5366.5 kHz. On November 12, Conference Working Group 4B agreed to the global secondary allocation, with power limits designed to protect primary services from harmful interference. Sub Working Group (SWG) 4B1, chaired by Dale Hughes, VK1DSH, had presented its output document with two options, the other being no change — a position many administrations favored going into the conference. The current compromise making the allocation possible still must clear two more levels at the conference. This won’t happen until next week, and the issue is not final until it does. ARRL CEO David Sumner, K1ZZ, who attended the conference briefly on behalf of the International Amateur Radio Union (IARU), congratulated the IARU team and the national delegates who advocated for the Amateur Service." "SWG 4B1 held 15 meetings over the first 10 days of WRC-15. During week 1, the discussion focused on whether there would be an allocation at all. A number of administrations and the regional telecommunications organization (RTO) representing Russia and 10 of its neighboring countries (RCC) were bitterly opposed. As week 1 closed, it became clear that the widest achievable allocation was 15 kHz and that a power limit in the neighborhood of 15 W effective isotropic radiated power (EIRP) would have to be part of the package." As they say, we shall have to wait and see! Craig has impecable taste in QRP portable outerwear, as you can see! In addition to mentioning it here, I am going to add his blog to the blog roll to the right. It's worth your time to read what he has to say. Craig not only goes out operating portable whenever he gets the chance, but he's also a dedicated Skeeter Hunter. Hey, that ranks him "right up there" in my book!. I think I found me a project for the Summer of 2016! I would love to have a Hexbeam, and the only two thing have been keeping that dream at arm's length is a) the cost and b) a way to support it. This article solves "b)". The way around "a)" is to start saving and to also consider what I can sell to make up the funds. With the solar cycle rollercoaster heading towards the dip, having a Hexbeam would be very, very nice. I could install this in a corner of the yard and crank it down when not in use and I think that would keep my XYL satisfied. I'm pretty sure this project is within even my meager carpentry skills. All I have to do is come up with some scratch for the antenna and mast (and a small rotator, too, I guess) and the time. The time, the time, the time ....... always the most precious commodity of them all. Even if it doesn't come to fruition, it's still fun to plan and dream. Even though I'm a big Elecraft KX3 fan, never let it be said that W2LJ's Blog is unfairly biased or discriminatory. If there are good (operative word "good") products out there that would/should be of interest to the QRP community, they WILL be featured here. And as such, the LNR LD-5 does look like a winner! It doesn't have all the features of a KX3, but then, not everyone needs or desires all the features of a KX3. And for what it's worth, if Elecraft didn't exist (Heaven forfend! ), I might be compelled to acquire one of these myself. For a full product review by James Hannibal KH2SR, you can go here to read all about it. This coming weekend, the South Plainfield CERT/RACES/ARES team, the Middlesex County RACES/ARES team and the State of New Jersey RACES/ARES team will be testing emergency communications resiliency in the event of a major CME (coronal mass ejection) such as The Carrington Event that ocurred in 1859. During our weekly ARES net this Friday evening, it will be announced that a major CME has been detected and that communications and the electrical power grid are expected to be severely disrupted within the coming hours. We will be advised to store our communications gear in a safe manner - basically in a Faraday Shield. Communications will go dark until Sunday morning, after the effects of the CME have passed. We will assume, for the purposes of this drill, that the VHF/UHF repeater system (as well as the cell phone system and the power grid) will have been "severely compromised or damaged". We will then see how well we can communicate on a town/county/statewide basis relying on VHF/UHF simplex and HF communications on battery or generator power. Of course it will be assumed that the gear being used had been adequately shielded and protected in advance of the CME event. It used to be that you just worried about natural disasters from terrestrial weather. Now we're becoming more and more realistic about the havoc that solar weather can play. And we're planning for it and planning for reacting to it. All in all a good thing. In the DX game, sometimes you have to be real good to work a new one, especially QRP. You might have to break a dense pile up, or perhaps you have to get up at some ungodly hour to work a DXpedition when there's a lull. Other times, you have to be lucky, or just at the right place at the right time. That was the case for me, yesterday. I was down in the shack, twiddling the dial (no pandapter in the W2LJ shack) on 10 Meters. It was mid-morning, and I was just curious whether or not I'd be able to hear any signals. There on 28.050 MHz was 9J2BO calling CQ - without any takers! Admittedly, off the top of my head, I had no idea where 9J2 was. But is sure as heck wasn't familiar, and if it's not familiar, then it's probably rare. So I dived in with all 5 Watts and gave a call. 9J2BO's signal was loud enough where I thought 5 Watts would be enough, and it turned out I was correct. It took one repeat, but he had my call! We exchanged signal reports. I gave Brian an 599 and I received a 559 in return - not bad for 5 Watts to Africa (Quickly inputting 9J2BO into Log4OM informed me it was Zambia. Hot dog!). Then the QSB kicked in (big time) and shortened our QSO. I cheated a tad and kicked in the afterburner just to make sure that Brian heard my final "TU ES 73", but the previous 99% of the QSO was carried out at 5 Watts - so I'm counting it in my personal QRP tally. A few seconds later, I heard Brian calling CQ again, and then he just faded totally into oblivion and I didn't hear anything more on 28.050 MHz. Not him, nor anyone else trying to call him. Right place at the right time. That's all it took for this ATNO!